Please choose if personalization is desired. 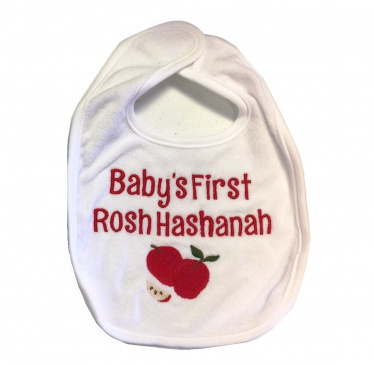 Our exclusive Baby's First Rosh Hashanah bib featuring two apples. Personalization of baby's name can be added for an additional $10. Please note: only room for one name. Measures 8.5" wide. 85% cotton and 15% polyester. Bib can be used for a newborn baby and up. Fill in the baby's name at checkout if personalization is desired.